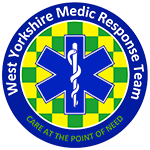 West Yorkshire Medic Response Team is a voluntary organisation providing pre-hospital emergency medical care in West Yorkshire. We also provide training and mentorship for doctors wishing to learn more about providing emergency care in the challenging pre-hospital environment. All our workers are volunteers, giving their time and expertise free of charge. But we urgently need your help to cover our running costs and specialist equipment. You can donate now by debit / credit card, all transactions are processed securely by PayPal. © Copyright. All rights reserved. West Yorkshire Medic Response Team. Charity Number 1130941.